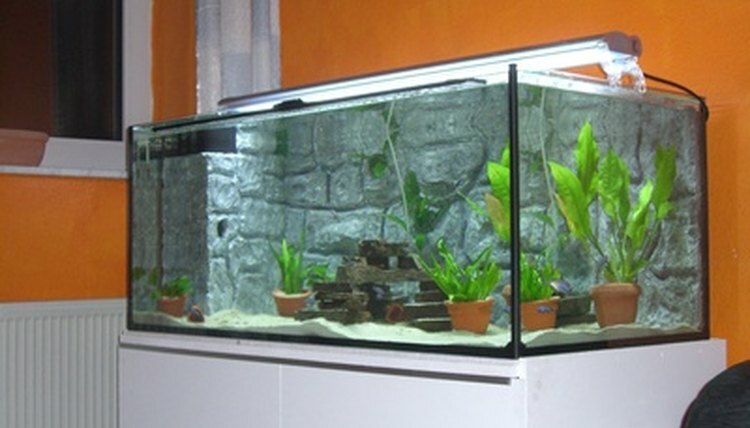 An aquarium filter is an important part of the aquarium set up. The filter plays a large role in the health of the aquarium inhabitants. The filter moves the water through a cartridge that removes wastes and odors by eliminating nitrites and ammonia from the water. Ammonia and nitrites can be toxic to aquarium animals. The AQUA-Tech 20-40 filter provides a three-stage filtration system to keep the tank clean. Correct usage of the AQUA-Tech filter and routine maintenance should provide for a healthy aquarium environment. Place all of the clean rocks and aquarium pieces into the tank. Fill the aquarium with water until the edge of the water reaches the top of the tank. The tank must be completely full so that the AQUA-Tech 20-40 filter will not be damaged. Set the filter on the top back side of the tank so that the water will run out of the filter and into the tank. The sloped area of the filter should be inside of the tank and the suction tube should be completely submerged in the water. Rinse a new EZ-Change #3 filter cartridge under cool tap water until all of the dust has been removed and the water coming out of the cartridge runs clear. Insert the cartridge into the filter grooves inside of the filter and fill the filter with tap water. Plug the filter into the wall outlet and allow the system to filter for at least 24 hours before introducing fish to the tank. Water should now be pouring over the side of the filter into the tank and being sucked up through the filter tube. Replace the cartridge inside of the filter every 30 days. Rinse every new cartridge you install so that the coal dust does not enter your aquarium's environment. Run your AQUA-Tech filter 24 hours a day, seven days a week to provide the cleanest environment for your aquarium life. Always exercise extreme caution when working with water and electricity. Never plug or unplug the AQUA-Tech 20-40 filter into the wall outlet with wet hands. The water in your tank will evaporate a little each day. Always top the tank off when it begins to get low so that the filter will not burn out due to running it without water.